As I’ve mentioned before, I’ve been a member of the organization Women in Music since 2007, a board member since 2011, general counsel since 2012, and most recently, I was elected Vice President! I am so excited to be taking on a greater leadership role within the organization. We have some great things planned for 2013. 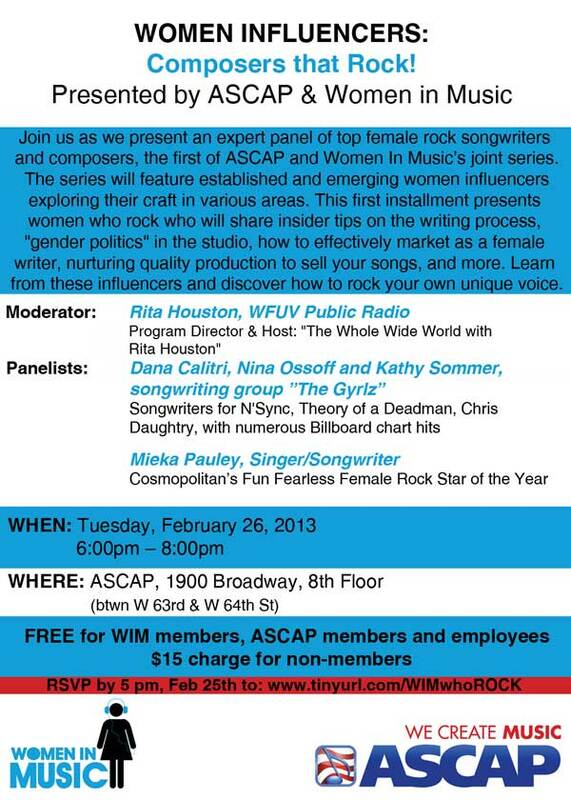 Our next event is February 26th at ASCAP – a panel of female Composer that Rock. Details below! There were definite highs (Kelly Clarkson, Carrie Underwood, Chick Corea) and lows (Frank Ocean, Frank Ocean, Frank Ocean) at the 2013 Grammys. It wasn’t part of the main show, but I wanted to also send out a special congratulations to my former engineering teacher at NYU, Jim Anderson, on winning the Best Surround Sound Album award.